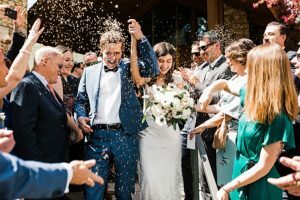 So you’ve finished up your session, received those gorgeous images from your photographer in digital format, posted them all over social media, updated the images on your wedding website, so…now what? Engagement photos are such a beautiful way to document this exciting time in your lives as a couple. With all of the focus on wedding photos though, it’s easy to forget about these special images you created together. I’ve come up with a few creative ways to use your photos that hopefully will get those images off your hard drives and out in the world for all to see! Save the Dates. Announce your wedding in style with beautifully designed Save the Date cards! With hundreds of designs to choose from and endless paper choices, your photos are sure to find something that fits your wedding theme and design. It’s also great for your guests to hang on their fridges and remind them of your upcoming event! I’m a huge fan of Basic Invite. See above for your discount for 20% off! Photo Guestbook. One of my favorite ways to use engagement photos is in a photo guestbook. Pages are designed in a way so that you can have your guests sign and leave messages around the images. You can order professional quality guest books from your photographer, or make one on your own with one of my personal favorite printers, Artifact Uprising. PRINT! Remember the days of filing through boxes of photos that your parents had kept throughout the years? It makes me a little sad to think that the next generation won’t get that experience. One way to change that is to print your engagement photos! Whether you’ve got a few frames you need to fill, want some fun images to display on the gift table at your wedding, or need a new piece from the wall, there are high-quality printers out there that can help you do just that! One of my favorite consumer-level print labs is MPix – professional stuff right there! I hope this has been inspiring for you to come up with some ways to use your engagement photos. Have you used printed your photos in a really fun way that you think others would love? I’d love to hear more of your ideas!